Plus, a video of Teddy and me making her Rosinenzopf. After the election, my friend Kara introduced me to the following words by the ancient Chinese philosopher Lao-tzu: "If there is to be peace in the world, there must be peace in the nations. If there is to be peace in the nations, there must be peace in the cities. If there is to be peace in the cities, there must be peace between neighbors. If there is to be peace between neighbors, there must be peace in the home. If there is to be peace in the home, there must be peace in the heart." Right now, for me, finding peace in my heart involves a lot of cooking. It has also made me think of homemaking differently. It’s made me think of it, to put it bluntly, as an act of rebellion. That being said, in the wake of the women’s march, I felt invigorated. Like many people I know, I wanted to do something more. I thought of my gifts. I then thought of food and my mother—of how she and I couldn’t talk politics over Christmas but how we could talk about what we were going to eat for dinner. Lots of people talk about how divided we are as a nation, but I don’t think that’s true. At least, it’s not the whole truth. In this new series of conversations with my fellow food writers and thinkers, I hope to highlight all of these above ideas, but mostly this idea that the truth isn’t so simple. The truth is filled with nuance. In this first conversation, conducted over email, I’m talking with Luisa Weiss—a Berlin-born, American-Italian food writer. She is the creator of the blog, The Wednesday Chef as well as the author of My Berlin Kitchen, a food memoir, and Classic German Baking, a cookbook published in late 2016. In My Berlin Kitchen, Weiss has a chapter titled “Eating for Heartbreak,” which immediately follows the chapter where after intense consideration and some truly meddling pigeons, she decides to break off her engagement. She writes: “…as black as your days may be—and black they are, that I’ll say—life does, amazingly, go on. As must you, one foot placed in front of the other; one tedious morning after another. And the thing is, you’ve got to eat. You can’t simply drop out of life.” She then goes on to describe a version of a Greek salad. It shouldn’t be so tantalizing and yet it is. It’s this kind of practical magic that makes me love food. And I think that bewitches Weiss as well. Amelia Morris: I recently heard the U.K.-born-and-based Zadie Smith talk about her latest book, the main character of which, like herself, is mixed race. She then discussed how her particular shade of skin allows people to see her how they want to—how people have begun conversations with her in Arabic, or Bengali, etc. Can you relate to this as a self-described Berlin-born, American-Italian? Luisa Weiss: Oh, so much. On paper, I may be Caucasian, but in the flesh, I have very dark hair and eyes and the kind of skin color (olive) and features that have over the years led Arabs, Turks, Persians, Latinos, and Southeast Asians from various nations to ask me if I'm one of them. (Often in their own language and repeatedly, since they're so confident I'll be able to respond!) My mother thinks that there must be some Saracen blood in my DNA from my maternal (Italian) side and on my paternal side, the swarthiness comes from generations of Eastern European Jewry. The ethnic confusion is compounded by the fact that my parents gave me a first name that is relatively familiar in several cultures, including the German one, and an originally Hungarian last name that means "white" in German. So to Germans, I'm doubly, triply confusing—a dark-skinned polyglot with a German name who was born here and can speak the language almost perfectly, but not completely. Weird! On the inside, my identity used to be more confused than it is now. I'm a "third-culture kid" - a child born to people of a culture different than the one they live in—but I didn't discover this term until I was in my early thirties and just ending a significant romantic relationship in no small part because of our inability to bridge the geographical and cultural divide between us. I had always thought my inner turmoil about my identity and where I belonged was something I had to endure alone, but discovering the concept of being a TCK was very grounding. Today, I feel pretty solid about my mongrel (I say that lovingly) identity as an American in Europe, married to a German, living around the corner from my Italian mother, raising bi- and trilingual children. AM: That’s not even to mention your identities as a mother, wife, writer, cook, daughter, etc. It’s confusing sometimes, right? LW: I think it's more confusing when you have to explain yourself to others who want a neat and simple answer, actually. These days, it feels pretty normal to be a working mother, a woman with interests outside of the home, and a multinational family. Or at least it feels more normal to me. Thank goodness! AM: Your latest book, Classic German Baking, is incredibly ambitious. You essentially tackle an entire culture. (I personally felt like I learned so much about the German day-to-day and also feel like I would love to do a cookie exchange with you next holiday season.) Was the idea always this big in scope? And/or how did you come up with the idea? LW: The idea was even bigger originally—the subject of German baking is so vast that you could, in theory, pen a "Silver Spoon" style book just on this one subject. In fact, the idea of the book terrified me precisely because of its potential size. How on earth would I ever be able to tackle such an enormous project? Luckily, my publisher gave me the freedom to narrow the selection of recipes down to a manageable number that would still ably represent the variety and scope of German baking, but wouldn't tether me to the test kitchen and my desk for the next five years. As for how I came up with the idea: Before I moved to Berlin and became a full-time writer, I was a cookbook editor in New York. It was there that I first realized the gap in the market where a German baking book belonged. I looked high and low for the right person to write the book, but always came up empty. Life moved on and I found myself in Berlin. Years later, the publisher of Ten Speed approached me to write the book because he too had seen this gap in the market—I'm sure there were other editors too who were on the hunt!—and thought that I'd be the right person to tackle it. Once I got over my initial fears (see above), I was thrilled to be given the task of explaining German Kaffee-Kuchen culture to American readers. What an honor! As for a cookie exchange with you: Yes please! AM: Part of the reason I ask is because I like the idea of an ambitious baking project. It feels both feminine and masculine. (When I think of baking, I think of women and homemaking. But at the same time, the word ambitious is often used pejoratively when describing a woman.) Do you think of baking as historically women’s work? In your research of these traditional recipes, did you rely heavily on women’s knowledge or men’s or was it a mixed bag? LW: Such an interesting question. When I think of home baking, I do indeed see it as more of a woman's thing. Because historically (and, uh, today, still, especially in Germany), women are still largely the ones at home, doing homemaking work, even if they're also out working and getting a paycheck. They're probably the ones getting the Sunday cakes made, they're the ones decorating the gingerbread houses with the kids, and the ones figure out what birthday cake to make when. (Because baking is such a big part of German culture, men are certainly not excluded from it. Many men I know bake at Christmastime and they all have pretty strong opinions on the subject of homemade cakes and cookies.) But professional bakers are largely still men. At all of the traditional, family-run bakeries that I know well in Berlin, the employees in the "Backstube" or "baking room" are men, including the "Meisterkonditoren." The women are the ones in the front, selling the goods. Going way, way back in time to when bakers were in guilds, they were all male—women simply didn't work. So the question of whether baking is historically more male or female is more complicated than you think! At least seen from the German perspective. AM: You have a beautiful newborn baby at home right now. In my experience, newborns have an amazing, fascinating, and sometimes frustrating way of telling your ambition to take a chill pill. What has your experience been like? LW: Oooh, sister, YES. It's such an incredible push-pull. On one hand, I love the crazy fog of the newborn time. I love how reduced your life becomes. How concentrated on one little thing it gets. How the days are, in their nuttiness, still predictable (feed, sleep, change, feed, sleep, change, etc etc). How easy it is to tune out everything and just go inward and focus. And because he's our second and last child, I can appreciate and savor the moments so much better than I could the first time around. On the other hand, precisely because I spend so many weeks in such a reduced state intellectually, when that urge to create rears its head again, it does so with a vengeance. But you can't suddenly plop your kid aside and go off to write for five hours—he'll probably wake up in 23 minutes! That's when the real challenge, as I see it, begins. Learning to juggle your thirst to work and have an identity outside of being a mother with an infant's myriad and constant needs. As I'm feverishly typing the answers to these questions, my baby has been napping on the sofa. Any minute now he's going to wake up and who knows when I'll find the time to be back at the computer again. So I type, type, type like a banshee in the hopes of finishing a thought coherently before the baby cycle starts anew. AM: Lots of the recipes in Classic German Baking call for a period of rest—whether it’s a few hours or a few months, like the dough for your Lebkuchen (Old-fashioned German Gingerbread). Do you think this idea applies to progress? To our 24-hour news cycle? Anything else? LW: Yes! Most things (besides salad) benefit from at least an overnight rest, if not longer. Creative work, for sure. Lover's spats, definitely. In general, being able to take a step away from something to get fresh air and a new way of looking at it will benefit whatever you're dealing with. AS for our news cycle, it's complicated. I definitely think that a lot of the "breaking news" stories out there could have used an overnight rest and I generally think the 24-hours news cycle has contributed to our civic breakdown. On the other hand, as someone who has always been interested in the news and who follows it obsessively now (thanks to midnight feeds, the 24-ness of the news is particularly relevant), I'm also grateful for all those hardworking journalists out there who are toiling like crazy to bring us as much information as they can in this very strange new world. AM: I recently read the rules to a 30-day detox touted by Goop. Here are the first seven of fifteen: “1. No alcohol. 2. No caffeine. 3. No dairy. 4. No eggs. 5. No beef, no pork. 6. No shellfish, no raw fish. 7. No gluten.” What are your thoughts on detoxing? Is there a place for it in German culture like there seems to be in American culture? LW: My thoughts on detoxing are, to paraphrase or quote Amy Poehler: "Good for her! Not for me." Everything in American culture eventually trickles down to German culture, so there are definitely detoxes in the ether here. On the whole, Europeans seem to have a slightly more balanced view on diet and nutrition than Americans. But the siren song of fitting into your bathing suit come summertime seems to be one that bewitches people across many cultures. AM: Do you think that in order to run for president, you should have to be able to make one really good meal from scratch? Or maybe be able to fry an egg with a runny yolk? LW: Ooh, I don't know! I don't think that cooking well inherently makes you a good or moral person. I think a good politician probably doesn't have a lot of time to hone their cooking chops. They're too busy being good public servants, or they should be in any case? I'm old-school—I think politicians should be the ones running for president, not reality stars or even Oprah (God love her). So I guess my answer is no. I'd rather my presidential hopefuls be smart, well-educated and capable of thinking deep thoughts about economics and history and health care and global poverty and prison reform and police violence. If that means they can't even open a can of baked beans, well, so be it. AM: If you could cook for any politician/public servant, who would it be and what do you think you would make? LW: I wish I could make dinner for Barack and Michelle Obama. My warm feelings for them have morphed into something far more desperate now—I adore them with a sort of trembly, feverish, terrified love, enhanced, no doubt, by the intense psychological misery that the current occupant of the White House is inflicting on us. I'd invite them to dinner at my mom's house in Italy and we'd have dinner on the patio outside, on the wood table that's water-damaged after years of being out there and under the big sun umbrella my mother put out there when we got married several years ago. There would be homemade tagliatelle with ragù, which is a specialty of the region, and grilled sausages and breadcrumb-stuffed tomatoes, and a big salad with greens from the garden and then baseball-sized peaches dripping juice all over the place and lots of wine and we'd eat and talk for hours until the sun went down and the fireflies came out and by the end, we'd be BFFs and they'd promise to come back every year. When the dough has doubled in size, gently tug it out of the bowl and onto a work surface. Knead the raisins gently into the dough, and then divide the dough into 3 equal pieces. Roll out each piece to a 16-inch strand. 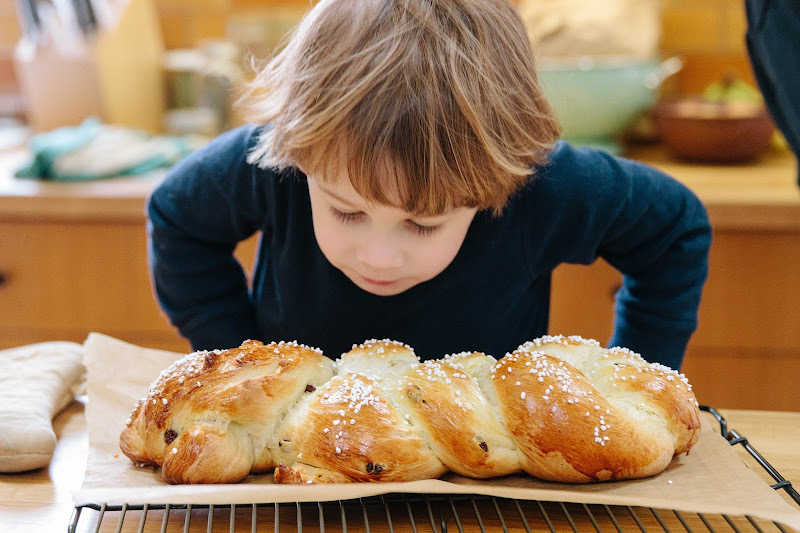 Braid the strands together, tuck the ends under the loaf, and place on the prepared baking sheet. Poke any exposed raisins back into the dough or remove and tuck into the bottom of the loaf (this is to keep the raisins from burning in the oven). Cover with the dishcloth and let rise for 20 minutes. Meanwhile, preheat the oven to 350F/180C. After 20 minutes, remove the dishcloth and check for any additional protruding raisins. Remove them or poke them farther into the dough. To make the topping; Beat together the egg yolk and milk, and brush the egg wash evenly over the loaf. Sprinkle the loaf evenly with the pearl sugar, the sliced almonds, or both. Place the baking sheet in the oven and bake for 30 minutes. The loaf will turn a rich bronze. If your oven runs hot and you are worried about the loaf burning, you may cover it with a piece of foil after 25 minutes of baking. What a great post. Thanks for starting this conversation! Love this post! Both the interview and the video. Thank you. Amen to that Italian dinner. You could make friends with anyone over that. Thanks for sharing your convo with us! Thank you Amelia for starting this dialogue and for asking such interesting questions, and to Luisa for your insightful answers. Thank you both for giving me the confidence and desire to try this bread I wouldn't otherwise have attempted. And thank you both for your fortifying, bolstering words, now more vital than ever. This interview is so great! Such fascinating questions and cohesive answers. Also: that video is adorable. Great editing, Matt! I also hope Teddy was okay after that fall? He had the grace of an Oscar-night actress tripping over her outfit, totally nonplussed. Well done! What a great idea Amelia, to open up a conversation like this. I love your blog and especially your videos and I look forward to both all the time. I hope that the conversation doesn't turn into a one-sided love affair with left politics. Frankly that wouldn't be nuanced or interesting. I am out here in New Jersey, a Democrat stronghold, and it can get lonely for people like me. I voted for Trump. I feel confident in my vote, no second thoughts. I have been very unhappy with the politics of the last eight years and I am hopeful about the future of the US, something I thought might be too far gone to ever change. At the same time, I'm here cooking away, burning forgotten brussels sprouts and making olive oil cakes and reading oh so many food blogs. I love my lefty neighbors, even the ones with really bad anti-Trump signs hanging on their houses. I also believe that love at home and in ones neighborhood can bridge any gap. I'm keeping the faith. Here's to cooking and food and that after all is said and done we are still the luckiest and most fortunate people in the whole wide world. We're Americans. Great conversation! Wish I could hang out with you both. Also, I want in on that cookie exchange. @Jodi Drennan ahh man, thank you SO much for writing. A huge impetus for this project is that I want to prove (to myself, to others) that we all have more in common than we don't. I really want to keep the conversations open so there's something for everyone, no matter who you voted for. Thanks again for writing! I love the ideas of cooking and food being common denominators and that cooking can be a rebellion against divisiveness. On the food cleanse topic, I'll add my two cents. While extreme diets aren't good thing (in my opinion), some kind of reset once in a while seems necessary. My 41 year old body has definitely changed it's metabolism from 10 years ago. For that reason I'm cutting out some things for a while. I'm need to break some unhealthy habitats and figure out how to eat for my (now slower) metabolism.